Bird Camp California was the second week of September at Monte Toyon, a camp in Aptos, CA. I loved spending a few days in the Redwood forest while connecting with both old and new friends. 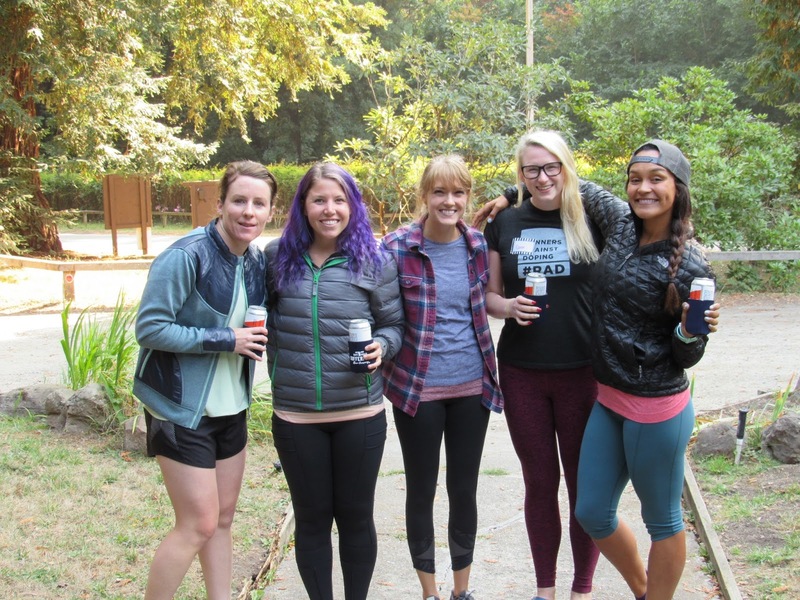 Oiselle started the 'Bird Camp' adventure in Bend, OR, in 2014, which I attended and absolutely loved. 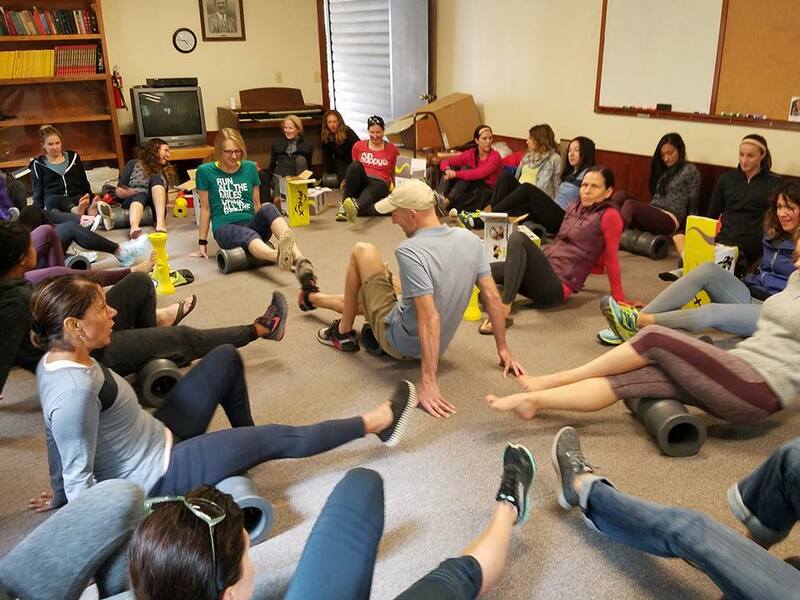 It was the first opportunity I had to meet many of the women, plus we had a chance to learn from the elite athletes and speakers knowledgeable in running, nutrition, and recovery. In 2015, I traveled to the Bird Camp in Leavenworth, WA, for a similar camp. The second year I knew many more people; it was awesome to see them again and to spend more time together. 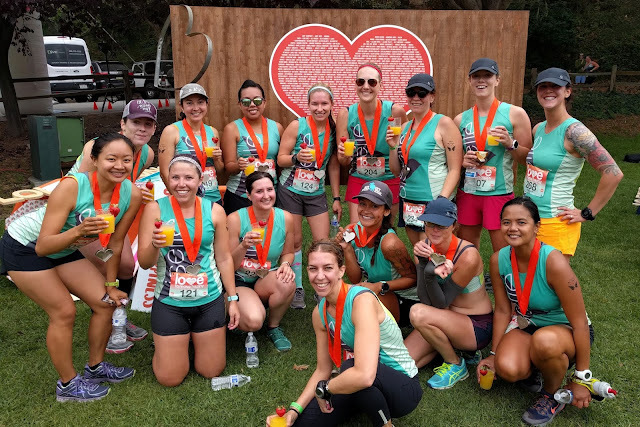 This year, with the huge growth of the Volée and thousands of women across the country, the Bird Camps changed from one camp to a series of regional camps across the US. Volée regional leaders volunteered to organize these events, and it's enabled many more women to participate and to connect with runners in the community. It's been fun to follow the different camps and to see photos from the unique locations. 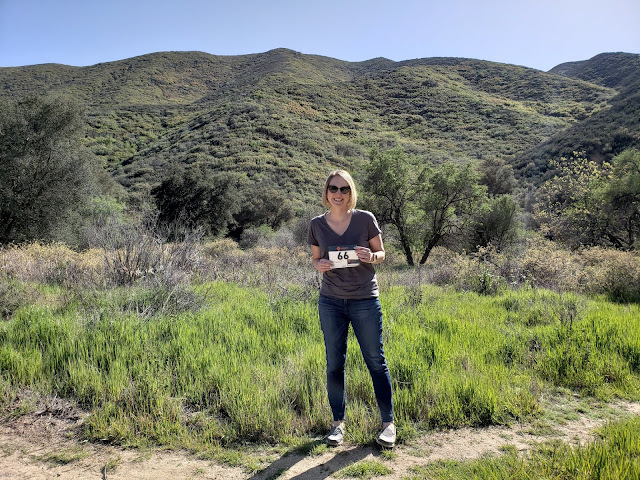 As one of the organizers of the California camp, I had a very different perspective than I have in the past. Organizing is something that comes naturally to me and I generally enjoy it, but it's also a ton of work. 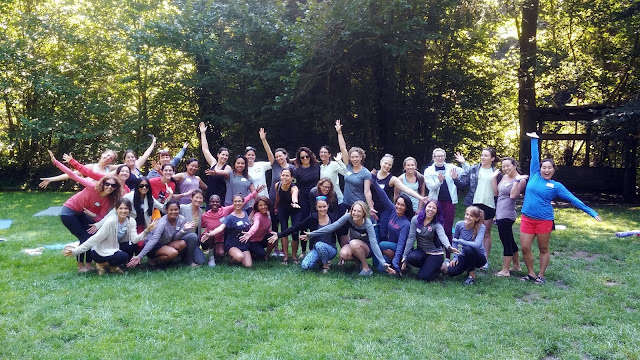 That said, I love that we were able to contribute to the Oiselle running community in this way and I'm thrilled with how well the camp turned out! Big trees. Nisene is a magical forest. Camp started on Thursday late-morning, kicking off with lunch and then an early afternoon yoga session. 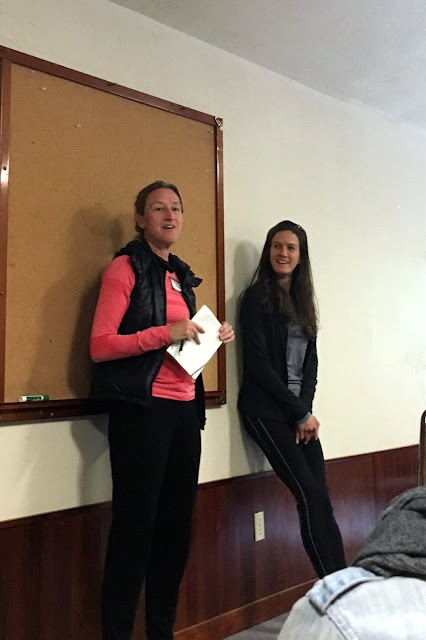 Next up, Devon Yanko chatted with the group about her recent [amazing] races and held an incredibly informative Q&A about mental toughness and training. I'm a total Devon fangirl and loved this! 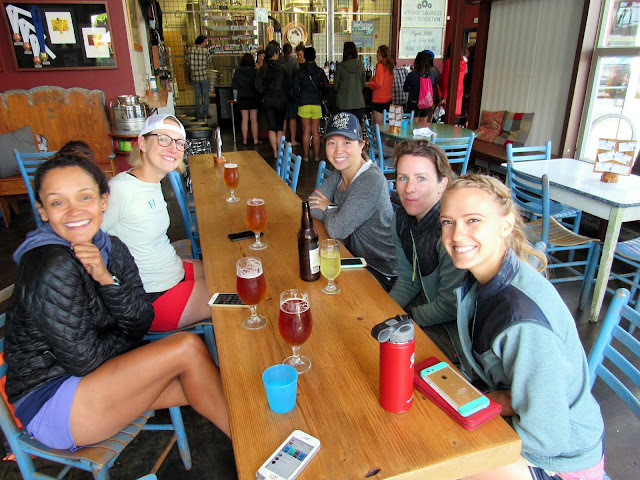 This talk transitioned to a fun happy hour with Sufferfest Beer, who graciously visited and brought us their gluten-removed beer to enjoy. I know what you are thinking - beer without gluten? Ew! - I thought that in the past too UNTIL I tried Sufferfest. It's truly fantastic, and the ladies who brew and work for the company are wonderful people. Even better, the beer names are runner-inspired. Taper IPA, anyone? The rest of that evening was spent at dinner and then a campfire. 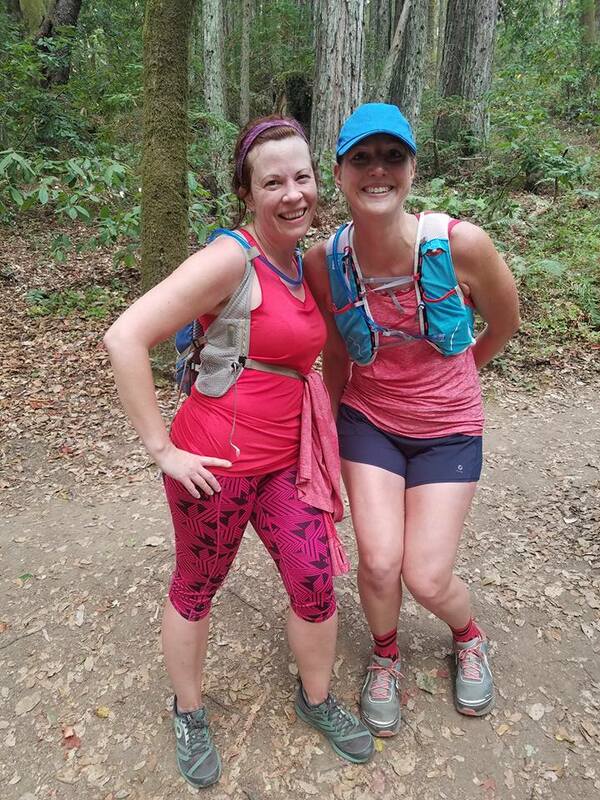 I also took a little sunset hike with Jennifer and Natalie to scout out the trail over to Nisene Marks for the next day's run. The campfire was a fun time to introduce ourselves, talk about our intention for camp, and of course to enjoy s'mores. Friday we woke up bright and early for our 'long run' day. 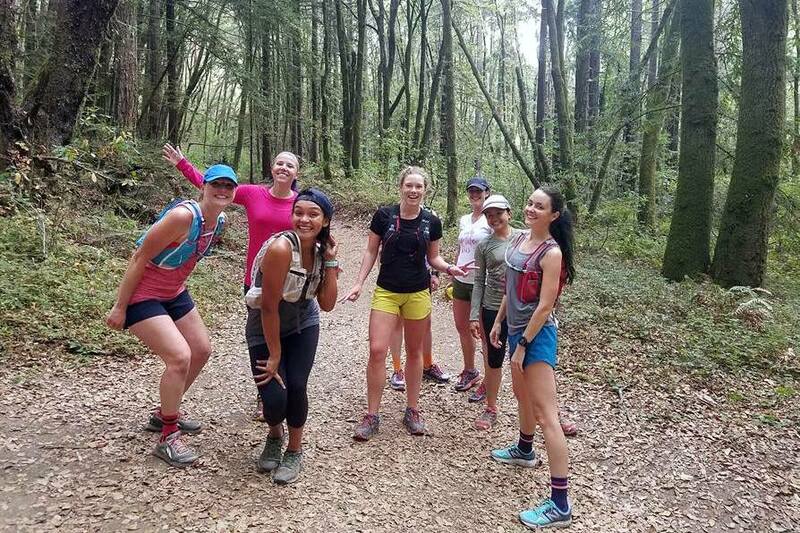 We met as a group and ran/hiked the short trail over to Nisene Marks, which was basically a climb up to the ridge and then fun downhill singletrack to the park fire road. 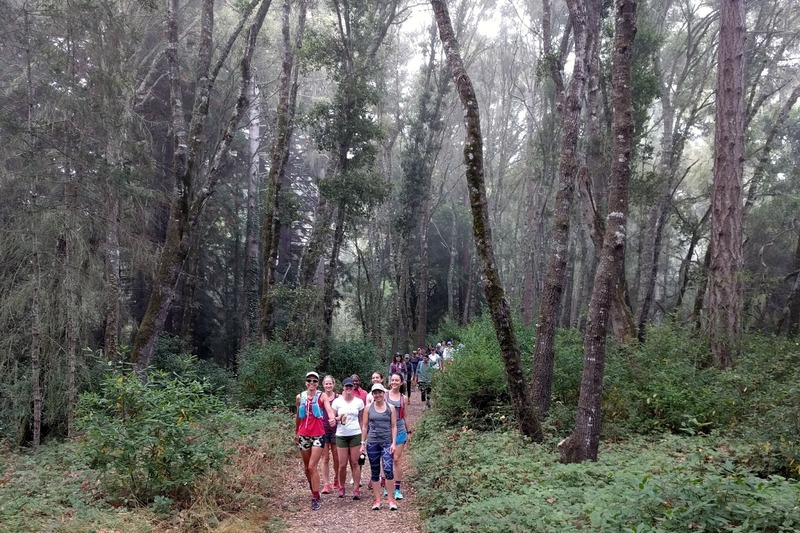 From there, we split into groups based on who wanted to hike, run trail, or run the road. 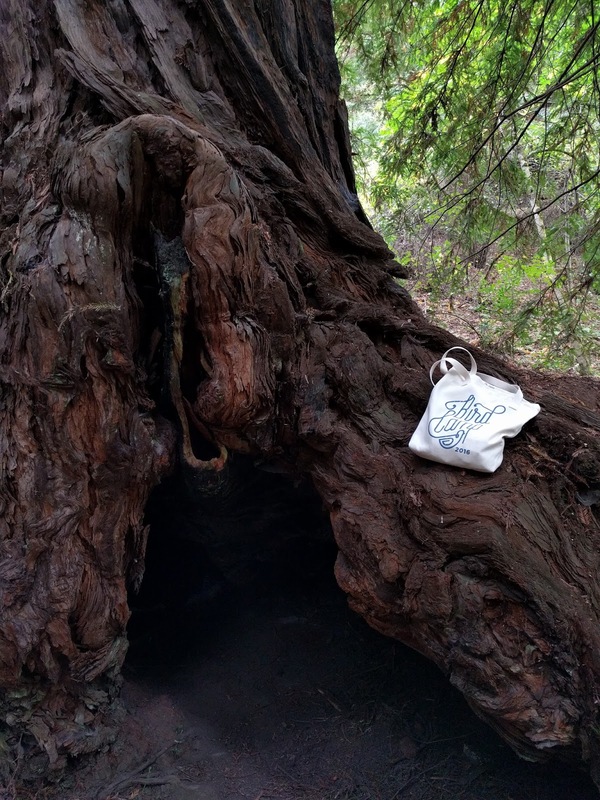 I joined a trail group and relished in 8.5 miles of pure Nisene enchantment. 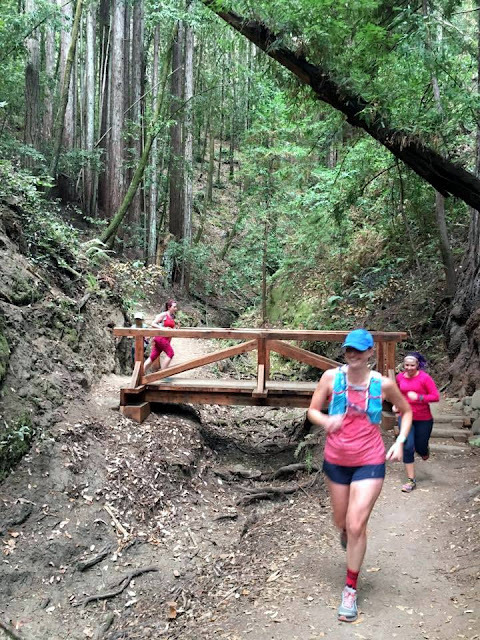 This is one of my favorite parks because of the beautiful trails and huge Redwoods. I had a cold and needed to turn around a bit earlier than others, so Alisyn was nice enough to turn back with me. I loved the extra time to chat with Alisyn; we don't see each other much since her move and I miss running with her. 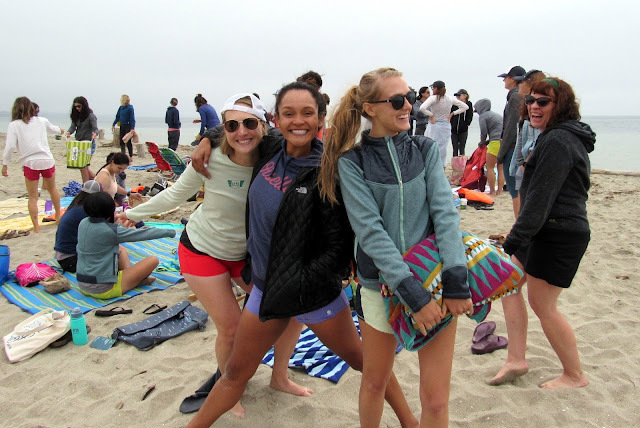 Post-run, we all cleaned up and headed to the beach for a picnic lunch. Unfortunately, it was quite cold and not a good day to chill and play games on the beach. After eating and hanging out for a little bit, many of us bailed and went to Discretion Brewery to get warm. Definitely the right decision; I loved their beer. That evening, we returned to camp where Kate Grace and Sarah Lesko talked to us about the Olympics. It was amazing to hear their stories firsthand, and Kate is such a fun and animated person to hear speak. 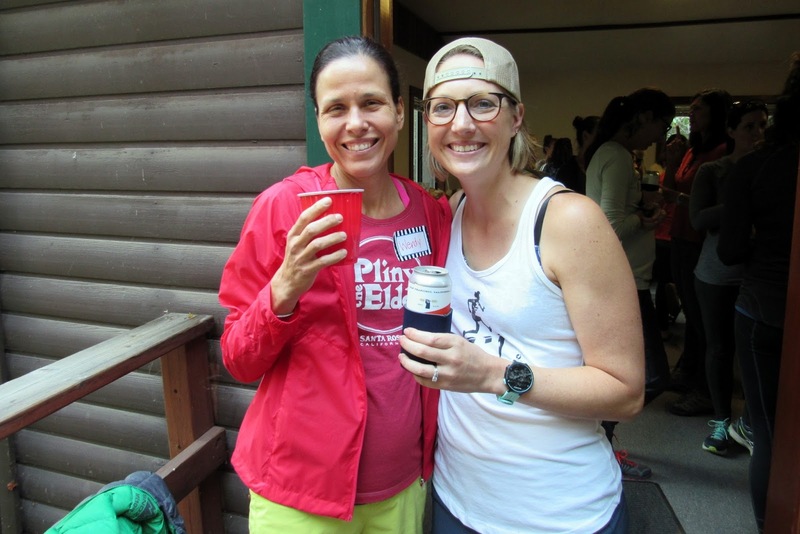 I'm a Kate fangirl too, and I'm beyond excited that she was able to join us at camp! We ended Friday evening with a talk from Lesko and Jess, our headquarters reps, about the product line, production, and inspiration behind it. I always find it fascinating to hear about design and this was a fun one. We had a chance to try on items from Fall 2016 as well. On to Saturday, the last full day of camp. We all attended a local, women-focused race called the Love to Move Happy 10K/5K. 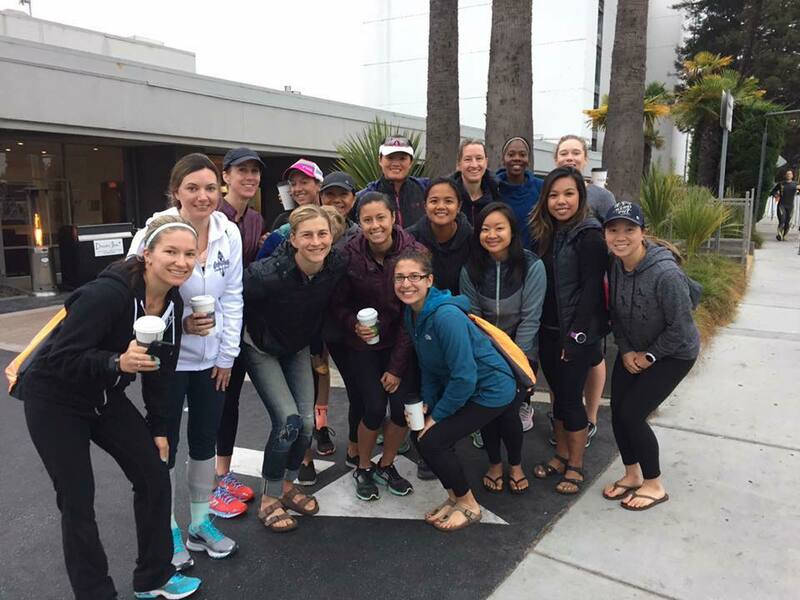 It was especially fun to head over to the race as a group and to see everyone out on the course! The race was well done and I would consider running it again in the future. 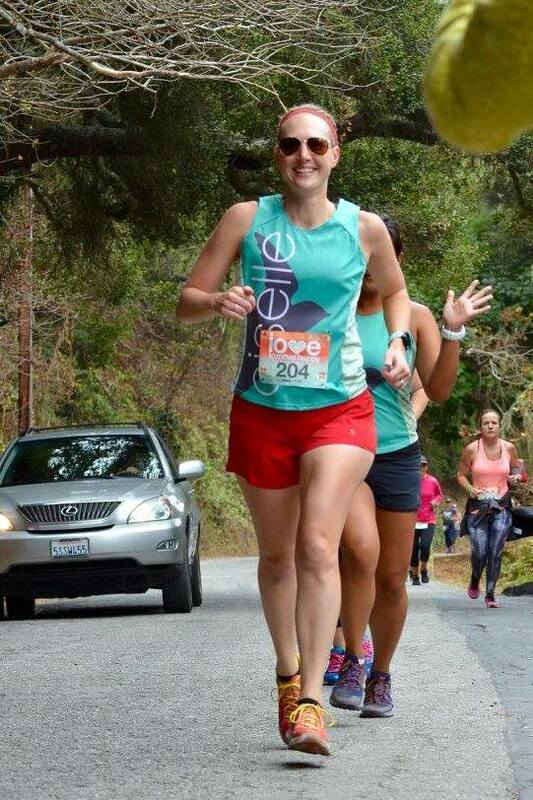 They gave us great swag (shirts, medals, reusable bags, keychains, and water bottles) and the race ran through Nisene Marks on the road. One of my fave weekend photos. Group with our mimosas! Our afternoon consisted of a Nutrition panel with the elites followed by a recovery and stretching talk by Mark Fadil. Mark has written a book on foam rolling and brought a PHLX foam roller, which he designed, for each camp attendee. We went through stretches and tips on how to use our awesome new rollers. I've been using mine since camp, and I absolutely love it. The roller session brought the official camp agenda to a close. We spent the rest of the evening chatting and making s'mores at the campfire. The following morning, a large group headed out to run with Lauren and to cheer for Jesse in the Ironman 70.3 Santa Cruz. I stayed back at camp with a few others to wrap up, but I love that everyone was able to do this. Perfect timing! Last but not least, a few special shout outs. To my co-organizer, Sophia, and the extra helping hands from Allie, Alisyn, Kim, and Leslie - you all helped to make this a success and I truly appreciate it. To Sarah and Jess - thank you for your expertise and HQ sessions. And to all the camp Haute Volée speakers (Kate Grace, Devon Yanko, Heather McWhirter, Molly Friel, Dominique Jackson, and Laura Carlyle) - thank you for sharing your knowledge, training tips, and stories. Glad to see that everyone had fun at Bird Camp! This looks SO cool. You totally rocked it!